Most workplaces now both appreciate the need for, and are allocating significant resource towards, supporting the mental health of their workforce. In general, support strategies are designed to help individuals with conditions that they bring with them into the workplace and to build resilience and help individuals to manage stress, both in and out of the workplace. In reality, the term ‘stress’ covers a vast range of potential hazards and responses. Without understanding those hazards and the specific ways in which they can affect individuals, workplace mental health strategies run the risk of being too general and as a consequence either being, or being seen to be, no more than a ‘tick box’ exercise. This seminar introduces managers, and anyone with responsibility for workplace mental health support strategies, to an approach that assists a much clearer understanding of potential psychological hazards in the workplace, including a tool to help assess and manage the risks associated with these hazards and a facilitated space to share experience, knowledge and existing good practice with peers. Facilitated group work using case studies. Jacqui’s early career was as an officer in the British Army, completing her commission as a Captain. She ran training and development centres in various military bases and served operationally in Northern Ireland, running an HQ operations desk in a crisis response role, and in Bosnia as part of the NATO SFOR stabilisation mission. She also trained as a helicopter pilot at the Defence Helicopter Flying School. After leaving the Army Jacqui retrained as a research psychologist, exploring psychological factors in risk management for natural hazards across cultures. Her career in disaster risk reduction took her to the US, Central and South America to work with scientists, communities and local and national governments, helping them to develop more effective and inclusive risk management strategies. Jacqui is a Chartered Research Psychologist with the British Psychological Society, specialising in the psychology of risk and resilience. 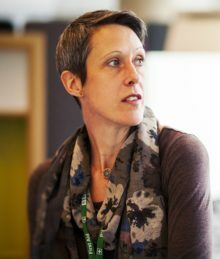 She now works as a freelance consultant providing a range of services including; training for people operating in ‘hostile environments’, guidance for identifying and managing psychological risks and training courses in personal and professional development, resilience building, leadership and mental health. She has recently worked with clients in Afghanistan, Kenya, Russia and the US as well as in the UK. She also works part time as a specialist advisor within the BBC. This seminar is for members of the Oasis Resilience and Wellbeing Network. To find out more about the network, contact Lise Ribeiro on 01937 541700 or by email.